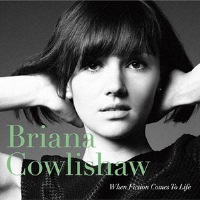 Description: A voice with a warm and silky timbre, lyrics that ooze honesty and contemplation and melodies that weave beautiful threads, Briana Cowlishaw is a Sydney raised vocalist and composer who has accomplished a large amount in her tender 24 years of age. Inspiration ranging from Nancy Wilson, The Beatles, Joni Mitchell, Ellis Regina, Fiona Apple, Ahmad Jamal and James Taylor, Briana's approach to singing and composition is quite an intriguing one. Her unique creativity and ability as a performer, improviser and composer continues to cultivate new opportunities for the young vocalist and is paving a very exciting path for her career both in Australia and on an international front. A graduate of the Australian Institute of Music (BMUS), Briana jumped on a plane to New York and recorded her debut album of original compositions When Fiction Comes to Life with renowned New York musicians Aaron Goldberg, Reuben Rogers, Gregory Hutchinson, Ambrose Akinmusire and Mike Moreno. The album was nominated for 'Best Vocal Jazz Album' in the 2012 Australian Jazz Bell Awards. Presented here is the Japanese CD edition released in 2014. All music and lyrics are by Briana with the exception of "Triste" and "Skylark," showcasing Briana's unmistakable composing style that weaves through the genres of jazz, latin and pop. With solid technique and ability to improvise, she is a real jazz singer. Her voice and vocal style are, to varying degrees, reminiscent of Sara Gazarek and Gretchen Parlato. As you can expect, the A-list New York jazz musicians provide a solid and fantastic foundation for her. An impressive debut album! Recorded October 20 and 21, 2010 at Systems Two Studios, New York.